Wisdom of Life. : What is Integrity? 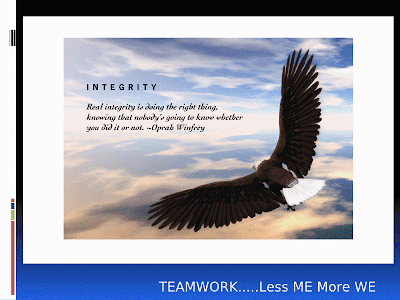 Over a recent sales talk, i brought up this word, INTEGRITY which means follow strict moral or has ethical code. Two true incidents were related on my work. A couple of years ago, i had a client who had a severe stroke, which led him to be permanent disable. He had taken with us an old insurance plan which entitled him a lump sum on disability plus yearly income for not being able to pursuit his work. Upon submitting his insurance, i was surprised the company only approved the lump sum payment and rejected his yearly income benefit. On investigation, i realized the claims management were ignorant over the old plans and they were not prepared to look at their old files for further understanding. Most younger generation took things for granted by assuming the old benefits and payouts were the same with the new. As i was the attending agent who sold this very old plan, i definitely knew and remembered the exact benefits. In order to be serious with the working claim staffs, i reminded them that though i was the agent from the same company, i was also representing my innocent client who could have forgotten what he had purchased from me. With a forceful warning, i insisted that they should recheck and thoroughly go through their references again. I gave them one week to work on it, otherwise i might consider to report to the Government Central Bank for their negligence and inefficiency. My severe warning and statement worked. Three days later, the head of the claims department called to thanks me for assuring this benefit that needed to be paid. I corrected their mistakes and my client got his full entitlement accordingly. On another incident, while making another claim for a client, an extra cheque amounting 50 thousand was accidentally issued under my client name. I asked a few associates, should i let my client has it or return it to the company. Everyone suggested that i should let my client to benefit this extra money. I was sad my client did not enjoy this windfall because i returned the 50 thousand to my company. I told myself, as an agent...we need to represent the clients and the principle, we have to take care both their interest at the same time. Integrity is the way to work for following strict moral and has ethical code. Integrity allows me to earn my respect, trust and reputation from my clients and my company. Today i am proud...all of them do listen to all my words in every way. The message from your post is loud and clear. It is also timely as the Word of Integrity seems to be erased off from the world or are they having different meaning to this word. It is very kind of you to refresh the true meaning of it and trust it will receive good response by all parties so as to create a better world for our loved ones. I wrote to share and you commented to offer inspiration. Thank you for that wonderful compliment. With you and James around, the world will have more integrity to honour. Thank you for your support. Integrity is what i don't have but now i want to have because i know i need it. Thanks for sharing this. Reading your blog, i could feel you are a man of integrity who is willing to share as well. Thank you for reading my blog too.